Considering how to position a new product line involves becoming acquainted with other products on the market. 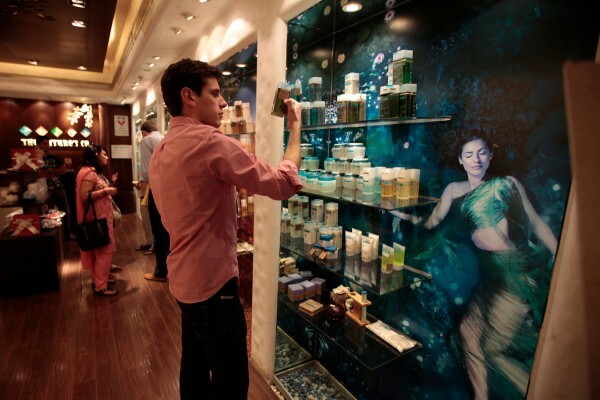 M.B.A. student Frederic Dijols reads product descriptions at The Nature's Co., a chain store that emphasizes use of natural ingredients and the influence of Ayurveda (Indian traditional medicine). Back at their hotel, the students (from left)—Thomas Lydick, Steven Pearson, Frederic Dijols, Chris Bruce, Nafis Atiqullah, and Jeff Suer—regroup to consider what they will recommend. The new FIELD course (Field Immersion Experiences in Leadership Development) at Harvard Business School (HBS) is designed for first-year M.B.A. students, but the faculty members in charge say they, too, are learning as they go. The course is earning plaudits from students; instructors and administrators have already heard that students have applied to HBS specifically because they find FIELD appealing, and course head Frances Frei, UPS Foundation professor of service management, promises, “It will be magnificently better next year, and magnificently better the year after that,” as those designing the program respond to feedback. In FIELD’s first (fall semester) module, students learn about their own leadership styles through exercises with classmates, receiving the kind of candid criticism that leads to growth. In the spring, the class’s 900 members are split into six-person groups, given $3,000 per group, and challenged to take a business from concept to fruition by semester’s end. As noted in “Into India,” on Harvard’s varied, and deepening, connections in India, the international experience is intended to show students, rather than just tell them, that doing business in an unfamiliar location and culture is different in all sorts of unexpected ways. Students were placed in one of 10 countries—Costa Rica, Brazil, Argentina, Ghana, South Africa, Turkey, Poland, Vietnam, China, and India—for an experience that was physical and emotional, as well as intellectual, notes Youngme Moon, David professor of business administration, senior associate dean, and chair of the M.B.A. program. Contemplating how to position a new line of hair-care products for the Indian market is one thing in the comfort of a Boston classroom. It is quite another when dealing with jetlag or the aftermath of traveling for hours over potholed roads in a car built for much shorter people. HBS hopes such international experiences give students “contextual awareness, even contextual humility,” dean Nitin Nohria wrote in an article on the future of business education. Nohria, Moon, and Frei like to compare the new model to medical education: no surgeon would be equipped to operate without hands-on practice, but that practical experience would be far less meaningful without prior study of anatomy. Orchestrating the FIELD experience was no easy feat: HBS had to mobilize nearly its entire staff, in ways great and small, to get 900 students immunized, plane tickets and hotel reservations booked, visas processed, and local transportation and reliable guides arranged overseas. Organizers used alumni, faculty, and donor connections to set up the student groups’ placements; the primary goal, they emphasized, was for students to learn, rather than for companies to get business advice, although some firms did, naturally, receive useful recommendations.